Nobody wants to think about the start of the school year -- least of all kids. But with Labor Day fast approaching, the countdown has officially begun, and that means it's time to get started on your back-to-school shopping. When it comes to shopping for the new school year, you want send your kid off to the classroom prepared to succeed, but you also want to make choices that are easy on the environment. 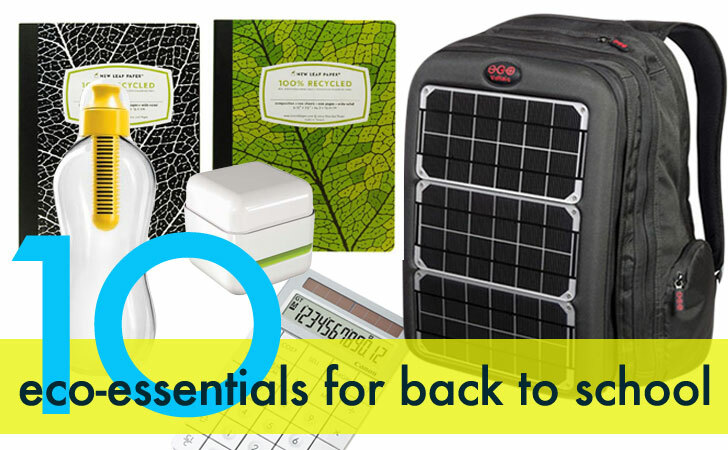 From calculators made from recycled camera parts to a solar-powered backpack, we've rounded up 10 of our top eco-friendly back-to-school essentials for the 2012-2013 school year. Each year, some 60 million binders that are made of PVC — one of the most environmentally destructive materials out there — are sold in the US. They release toxic chemicals and they never break down. By contrast, Naked Binders‘ cardboard binders are made from 100% post-consumer waste, are 100% recyclable, and they look pretty nice too! There are a bunch of reasons we like Bobble water bottles. First, they encourage kids to drink water instead of soda, chocolate milk, or other sugary drinks; and beyond that, they promote drinking tap water instead bottled water. 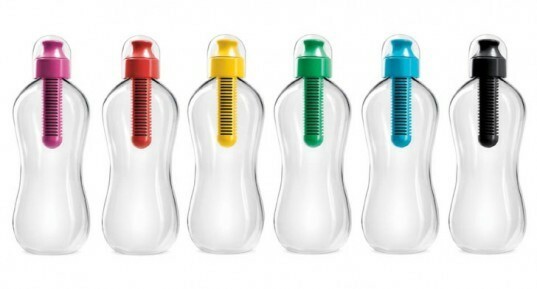 Bobble’s BPA-free reusable bottles contain a built-in, replaceable carbon filter that filters out chlorine and other organic contaminants for at least 40 gallons worth of water. Let’s face it, just about every kid has a smart phone, a laptop and/or a tablet these days. And if you’re typing and texting all day, you’re going to need to recharge at some point. That’s where Voltaic’s new Array Solar Backpack comes in. With 1,500 cubic inches of storage, the heavy-duty, waterproof bag has enough space to haul all of your books. 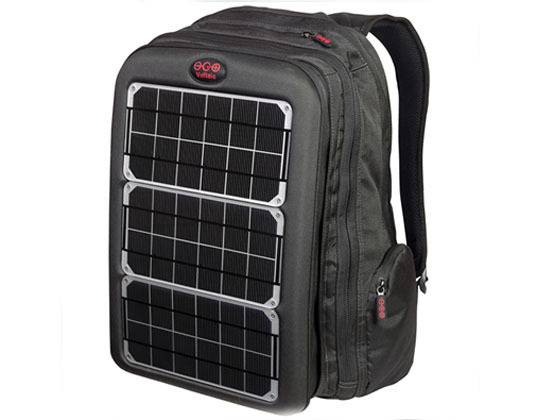 And with a big solar panel and a 60 Watt hour battery, it has enough juice to fully recharge your batteries when you’re on the go. Pencils will never be the most exciting back-to-school accessory, but they’re essential for any student. 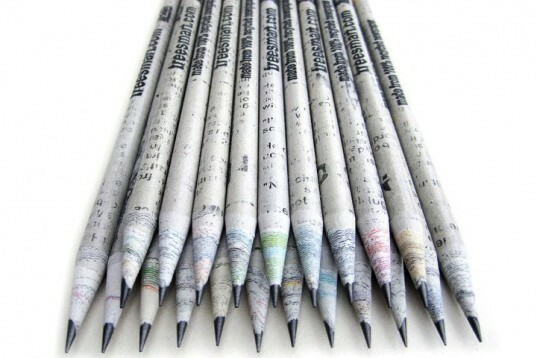 When it comes to pencil makers, one of our favorites is TreeSmart, which makes pencils out of rolled up recycled newspapers. The company tightly rolls whole sheets of newspaper around #2 graphites, and they sharpen just as easily as any wood pencil. If you buy some new pens and pencils, you’ll need a pencil case to put them in instead of letting them sit loose in your backpack. 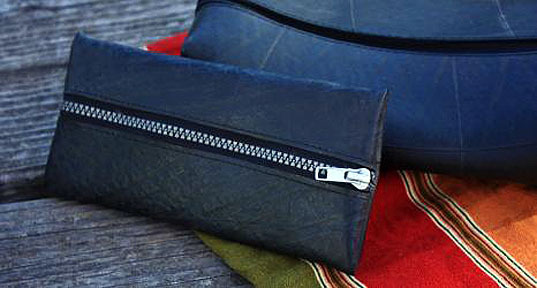 ASHA Handicrafts Association produces these awesome Fair Trade pencil cases that are made of recycled tires. The industrial-chic cases feature a big, durable zipper, and they’ll keep the contents of your bag safe from ink and graphite. Composition notebooks are used by students in schools across the country. But why should we need to cut down a tree to make every new composition notebook? 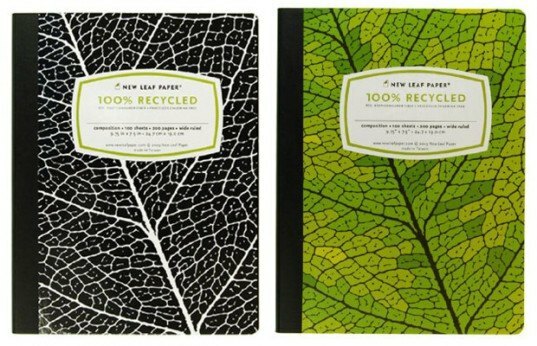 That’s the question asked by New Leaf, which turned over a new leaf when it introduced its 100-percent recycled paper composition notebooks. At $3.49 per 100-page notebook, New Leaf‘s product only costs a dollar or two more than the non-recycled alternative, and they’re processed chlorine free. Every kid needs a calculator, and there’s no getting around that. So why not get them a calculator that’s a little easier on the environment. Camera maker Canon recently rolled out a line of calculators, ranging from basic computation calculators to advanced scientific calculators, that are made from recycled lenses and plastic from cameras. And because it’s Canon, unsurprisingly, some of them look pretty slick, too. A stapler is pretty essential for any student who has to turn in a term paper, a book report, or even just a couple pages of math homework. Add it all up, and we’re talking about a lot of metal staples that will be used once and then thrown away. Made By Humans came up with a clever solution to all that metal waste by developing a staple-free stapler that fastens pieces of paper together by cutting out a tiny strip of paper and stitching up to four pages of paper together. Best of all, you never need to refill it! 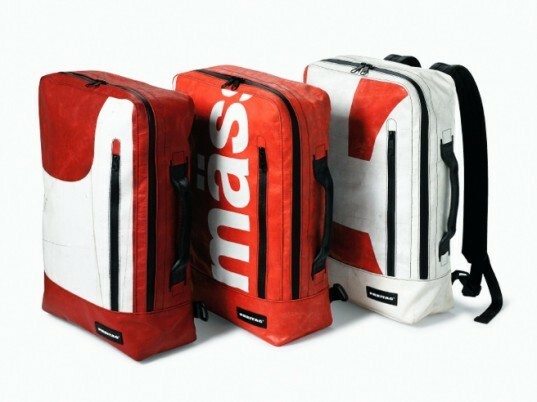 Form meets function with Swiss company Freitag‘s super stylish backpacks and shoulder bags. Every component in the bags are recycled materials. The main structure of the bags are recycled truck tarps, the straps are recycled seat belts, and the trim comes from old tires. And because each bag comes from a different truck tarp, they are all unique. The basic Freitag backpack features durable zippers, two small outer pockets, and an inner strap that holds a 17-inch Macbook. Bringing your own lunch to school is of course a healthier option than eating what the lunch lady is serving up, and it can also be better for the environment. But why send your kid to school with a brown bag when you can pack their lunch in a reusable container? 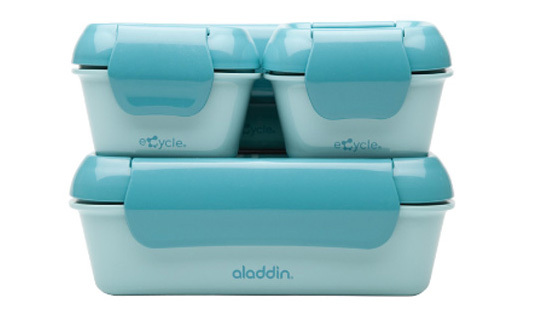 Aladdin lunch sets are BPA-free, and they’re made from 100% recycled food-grade polypropylene. 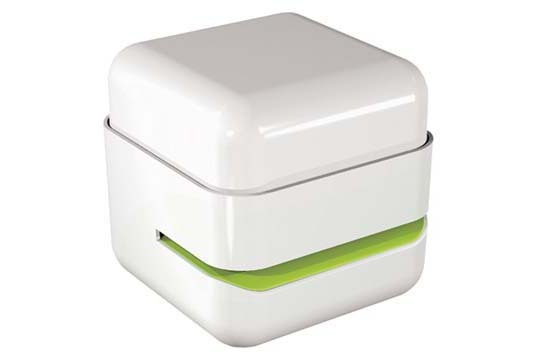 The sets contain different compartments to hold sandwiches, salads, pasta, and snacks. Bobble Water Bottle There are a bunch of reasons we like Bobble water bottles. First, they encourage kids to drink water instead of soda, chocolate milk, or other sugary drinks; and beyond that, they promote drinking tap water instead bottled water. Canon recycled calculators Every kid needs a calculator, and there's no getting around that. So why not get them a calculator that's a little easier on the environment. 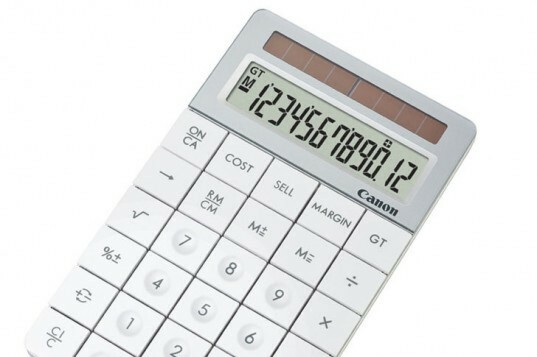 Camera maker Canon recently rolled out a line of calculators, ranging from basic computation calculators to advanced scientific calculators, that are made from recycled lenses and plastic from cameras. And because it's Canon, unsurprisingly, some of them look pretty slick, too.